Excellent branding makes organizations stand out from their competitors. Apple, Nike, Starbucks, are just a few examples of businesses that have carved out a unique brand with mass appeal and intense customer loyalty. These brands have a reputation of providing outstanding products with superb customer service. This kind of successful branding is difficult to achieve. Many people mistakenly assume that building a brand is a top-down process that can be carefully constructed and controlled: You simply apply the best principles of branding, create something, then adjust according to the market. But phenomenal branding isn’t that simple. A business owner is not the only one responsible for creating and developing an organization’s brand. Rather, building a brand is a dynamic, ever-changing process that is profoundly impacted by external variables, in particular, consumers and their ratings and reviews. The most successful brands are built on truth: what a brand truly is and does, rather than what it aspires or claims to be. Public perception is a window into brand truth. In fact, ratings and reviews are a powerful consumer voice that ends up developing its own message about a brand. This is extremely important because your brand will be damaged If public perception is not aligned with your messaging. “emotional connectivity” creates loyalty beyond reason. This kind of loyalty is invaluable, especially since consumers can be fickle. According to Neilsen, 92 percent of people trust word-of-mouth recommendations above all others. A Zendesk survey supports this, showing that 40 percent of consumers who read bad online reviews of a product will start looking at and buying another competing product. Staying current is imperative for companies seeking to promote brand belief and positive customer experiences and reviews. By keeping up with trends, customers will feel like you care about their needs. This is also a great way to establish brand loyalty. The consumer marketplace emphasizes the values of transparency and consistency. These are especially important factors online, where the customer’s voice is heard. Brands that display these attributes will be rewarded. Innovation is also crucial for companies wishing to remain relevant and maintain brand loyalty. According to a study in the Open Journal of Business and Management, brand image is the key driver of brand equity, which is a consumer’s general perception and feeling about a brand. Brand image significantly influences consumer behavior, and should be prioritized at all times. 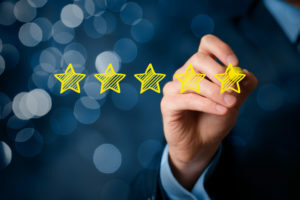 Seasoned and budding entrepreneurs need to be aware of the immense impact consumer reviews and emotional connectivity have on branding. This is why consumer experiences must be at the heart of any successful brand strategy. Join me at Sharon Lechter’s exciting, upcoming Breakthrough Marketing for Breakout Sales event on April 14 to learn more about branding and the impact of consumer reviews.